Impossible. That was my first thought when I saw the class roster. In one of my ninth grade English classes, 13 of my 27 students had IEPs. Additionally, about one-third of the students had failed the class the previous year. I dreaded even meeting them on the first day of school. But then something wonderful happened: The principal assigned me a co-teacher, a special education expert to serve as another set of hands (and eyes and ears!) during this class every day. I was thrilled. My co-teacher Sandie was a joy to collaborate with, but our relationship was by no means perfect, especially at the beginning. We often struggled to find planning time. Sometimes we disagreed about how to best help a particular student. However, we nurtured the co-teaching relationship and, in time, found a rhythm that worked for us—and for the students we served. In the years since I co-taught with Sandie and other teachers, I’ve coached and consulted with dozens of successful and not-so-successful teams. Co-teaching, when done well, offers benefits for both students and teachers. When not done well, it can be confusing or downright frustrating for all involved. If you are or will be part of a co-teaching partnership, this post will show you some ways to make your partnership work beautifully. In a co-teaching relationship, also known as a “push-in” arrangement, a general education teacher partners with a specialist who may be certified in teaching English Language Learners (ELLs), students with learning disabilities, or some other special population. A co-teaching team works in the general ed classroom; for the majority of the time, students with special needs are not pulled out to receive services in another location. For instance, a middle school social studies teacher may have an ELL teacher co-teaching with him during one class period because five students in that class are newcomers to the United States and speak only Arabic fluently. A high school teacher may have one or two sections of biology to which many students with IEPs for reading are channeled; a co-teacher who specializes in reading disabilities co-teaches in these classes. A 4th grade teacher may have two students with 504 plans and another three who have specific learning disabilities in her class; she works alongside a special education teacher daily during lessons in the four core academic subject areas. For more background, download this Brief History of Co-Teaching. One teach, one observe: One teacher delivers instruction while the other observes student learning. Usually the observer collects data on student understanding so that the co-teaching team can better plan future instruction. Sometimes, specific students are watched closely so that the teachers can determine new strategies to use with them. One teach, one assist: One teacher takes the lead in providing instruction while the other moves around the classroom, assisting struggling students. This help is not limited to students with special needs; the assisting professional is there to serve whomever needs support. Parallel teaching: The class is divided in two groups and the same material is presented simultaneously by both teachers. The teachers plan the two groups deliberately to maximize the success of all students; this is not simply a “pull-out” or intervention group sitting in the same room. Station teaching: Both teachers are actively involved in instruction as students are divided into groups and rotate from one station to the next. There may be stations where students work independently or with a paraprofessional in addition to the two stations the co-teachers facilitate. Alternative teaching: One teacher takes a small group of students and provides them more intensive or specialized instruction that is different than what the large group receives from the other teacher. Team teaching: Both teachers teach the content at the same time in tandem or “tag team” fashion. It is important to note that both teachers have equal status and equal responsibility in all six of these arrangements. In the co-teaching relationships that work best, at no time is one teacher seen as subordinate to the other. Both professionals are credentialed professionals, although each may have his or her specific areas of expertise. Researchers and practitioners have tons of advice about how to co-teach effectively, and as a person who has been “in the trenches” with several different co-teachers, so do I. The advice below sums up the most common recommendations. Not surprisingly, mutual respect is critical to the co-teaching relationship. You’ll have to share ideas openly and do much of your work facing students together, so respecting each other is paramount. Sometimes you’ll disagree, and that’s to be expected. As co-teacher and ELL specialist Melissa Eddington says, it’s fine to disagree with someone’s ideas, but don’t make the disagreement about the person. Susan*, who is licensed in both secondary science and learning disabilities, works with two physical science teachers and one biology teacher. The physical science teachers welcome her ideas and eagerly adjust their lessons based on her suggestions. They are seeing a steady increase of students mastering the required standards in the classes Susan supports. The biology teacher, however, dismisses many of Susan’s ideas and accuses her of “dumbing down” his content. Susan feels disrespected and finds it hard to even be in the room with the biology teacher because he constantly positions himself as “the expert” and places her in a subordinate role. Words and gestures speak volumes. Take care to show respect for your partner in all you do. 2. Clearly define roles and responsibilities. Co-teaching works better when the partners agree on who does what, when. Clearly defined roles and responsibilities prevent either partner from feeling the other has overstepped a boundary or shirked responsibilities. Natalie Marston (2002-2015), an elementary special ed teacher, recommends co-teachers reach agreement on scheduling, classroom procedures and behaviors, classwork and homework policies, grading, and school/home communication together so they present a united front at all times. Obviously this type of planning requires a great deal of time, ideally before school starts. If extended time is not available prior to the beginning of the school year, then the co-teaching team should expect to put in extra hours before and after school in the first few weeks so things get off to a good start. My co-teacher Sandie and I did not have advance warning of our assignment. We found out about it on the first teacher workday, leaving us only a few days before the students arrived. For weeks, we both felt like we were playing “catch up and keep up,” but found that having lunch together (and some happy hours together) helped us stay in sync. Innovation is difficult. That’s why so many teachers find themselves falling back on comfortable (and even tired) activities and strategies. Co-teaching allows you to gain another person’s perspective on how instruction might be improved, how students might be best assessed, what resources to use, and so much more. Sometimes this means one person has to put aside his or her favorite tried-and-true strategy and try something different. When Susan suggested a tactile, quiz-like method for reviewing the periodic table to her physical science co-teaching partners, they were skeptical about the time and materials it might require. They initially felt it would be more efficient to simply give additional notes to their students and then pair students to quiz each other. However, they agreed to try the review Susan’s way. The students loved the activity, and almost every student with special needs passed the chapter test two days later. All three teachers were thrilled and committed to using the activity in future years. The co-teaching relationship brings together two people with wonderfully rich expertise and experiences. Special educators are typically skilled in individualizing curriculum and instruction based on children’s needs (Dettmer et al., 2005; Volonino & Zigmond, 2007). General educators, on the other hand, tend to have broad knowledge of the curriculum, standards, and desired outcomes for the larger group. Therefore, when general educators plan lessons, they tend to aim for the masses (Dettmer et al., 2005). Both perspectives are important, and co-teaching teams need ample planning time to work through how to best utilize each one. Lack of planning time can lead to territorialism. Without time to plan for a good balance of content and individualization, a general ed teacher may become protective of his subject matter, or a specialist may become protective of his students. Emma*, a high school special ed teacher partnered with two geometry teachers, has experienced this. One teacher often asks Emma to pull aside the five or six students with specific disabilities within his class and work only with them. He sometimes says to her, “You worry about your kids. I’ll worry about geometry.” The principal is now providing an additional hour of planning time for Emma and this teacher. An assistant principal who oversees the math department facilitates the meetings so Emma feels supported and the geometry teacher has another content-area expert to hash things out with. Keep in mind that planning must include both instruction and assessment. Considering many students with special needs have legal accommodations for assessment (like being provided translation, extended time, or oral reading), it’s best to include both partners fully in designing quizzes, tests, papers, and other high-stakes assessment tasks. How much time is ideal? One study found that co-teachers desired, on average, 15 minutes to an hour each day for planning (Dieker & Murawski, 2003). This figure corresponds to what worked for my co-teacher and me, and it also confirms what I hear from many co-teachers in the field. Strive to find that time any way you can. Innovation requires failure. Many times, teachers feel they’ve failed somehow during instruction, and in reality, the students haven’t even noticed. We are often our own worst critics. Revisiting or correcting something later in the day (or the next day) doesn’t mean you failed earlier. It means you’ve learned something since. This is the kind of ongoing learning we want to model for our students. Planning time is one thing; constant communication is another. Not only should co-teachers frequently plan for what standards will be covered, how material will be taught, and how students will be assessed, they should also regularly communicate in less formal ways. Some other teams I’ve worked with use texting and emails throughout each day to share updates. 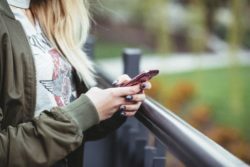 Voxer, texts, and emails can all work well, especially if one teacher has urgent information or an urgent question about a particular student. Teams can use Google Docs or other shared documents to keep track of lesson planning and to share feedback with each other on how lessons went. Collaborative documents can also be used to provide each other with information about targeted students. Would different teaching formats better utilize the two of us in the classroom? Finally, co-teachers need to present a united front when dealing with parents. Some partners go as far as to create a shared email address from which all communication flows. This may or may not be practical in your situation. At the very least, important parent communication about a student’s progress should be drafted by both parties. For more in-depth information about communicating and collaborating with your co-teacher, see Communicating and Collaborating in Co-Taught Classrooms (Conderman et al., 2009). Sometimes, teachers have been scheduled to co-teach by administrators but didn’t have much advance notice. This is what happened with Sandie and me. We were able to find snippets of time during the school day to use for planning and checking in with each other, but we had no common planning period. If you and your partner don’t have a common planning time when you can frequently collaborate, ask for it. Go to your principal with a couple of proposals about how this can work without too much disruption to the rest of the schedule. Sometimes co-teachers may not understand fully why they are being asked to team. If this is the case, ask for a meeting with the principal and any others responsible for the assignment. Ask them why they thought the two of you would be a good fit and what they hope you will accomplish with students. Dettmer, P., Thurston, L., Knackendoffel, A., & Dyck, N. (2009). Collaboration, consultation, and teamwork (6th ed.). Columbus, OH: Pearson. Friend, M. & Cook, L. (1996). Interactions: Collaboration skills for school professionals. White Plains, NY: Longman. Volonino, V. & Zigmond, N. (2007). Promoting research-based practices through inclusion. Theory into Practice, 46(4), 291-300. Thank you for this article. It’s very timely for me as my school is experimenting this year with more co-teaching situations. Of course, time is always the culprit since planning is so critical for a co-teaching partnership to work well. I am grateful to have a specialist to collaborate with and can see how this relationship has matured since the beginning of the school year. Appreciated reading this article. I, too, had a good experience with a push in model. The difference for me was my class was a 25 student 5th grade reading class that had been divided by ability: combination of the struggling readers + ELL students + special education students. This combo inspired the ELL and SPED teacher to join me in my classroom. We planned together and worked well in tag team, station teaching and one-teach-two assist. The end results? As a group we read the text aloud together in less than 3 class periods (The Secret Solider, Deborah Sampson). This alone blew some of the kids away. Words like, “I have never finished a real book that fast,” were shared. Students felt empowered and supported (with recorded audio tapes of the book read by the 3 teachers) to reread the text we had finished as a group , students were engaged, 1st year English language learners engaged with native speakers and struggling writers empowered to write. I have not had the opportunity to replicate this work again. The trio of teachers planned together during school hours and after school hours. The idea was new. The process was a lot of work up front, but the benefits were great. I would jump in and do this again. I love the practical advice. Co-teaching is such a beautiful thing when done well, but so painful when done badly. It’s like a tap dance and here you’ve laid out the steps so nicely. Thanks! Laugh! And laugh! And laugh! At yourselves, at the wonderful things kids say, at the mistakes we all make. It’s OK to be wrong…..the job is to not let it break you, but instead to laugh about it, brush it off, and try once again. Bobbi Delong, I love your advice! Great article. I have been an intervention specialist for many years and have used resource room, self-contained, and co-teaching models. I’ve exclusively co-taught since 2009, and I will never go back. It’s a best practice model! Here’s the article I wrote about this powerful work. Hey Krista, this is Debbie, one of the Customer Experience Managers at CoP. Thanks so much for sharing! Hi Laurel, I’m a Customer Experience Manager with Cult of Pedagogy. Unfortunately, Jenn doesn’t do this kind of consulting, but I’m happy to leave your question here in case somebody else comes along, finds it, and can offer their services. Loved this post. I also really appreciated the links to additional tools that help to provide some initial questions to help identify teaching and working styles! I am completely overwhelmed with push in intervention every 45 minutes of my day. I work with small groups in 8 different classrooms in two different grades during station time. There is absolutely no time to plan with anyone. Most of the classrooms are completely unruly, and the environments are in no way a learning environment. This is the first year we have tried push in, and the students are making much slower progress than last year’s data shows. Co-teaching is exhausting if you have zero authority, zero planning time and zero support from administrators. I’m sure it works, but even after reading this article, I’m not sure how. I would much rather just pull my group out, so they could work in a calm environment. Thank you for your articles. They are usually just what I need, but it seems my district has taken a good thing and made it bad. It sounds like you have a tough situation on your hands. Teaching is hard enough and it becomes even more difficult when you don’t feel supported. Here’s a post that you may be interested in taking a look at: What Teachers Want You To Know: A Note to School Administrators. 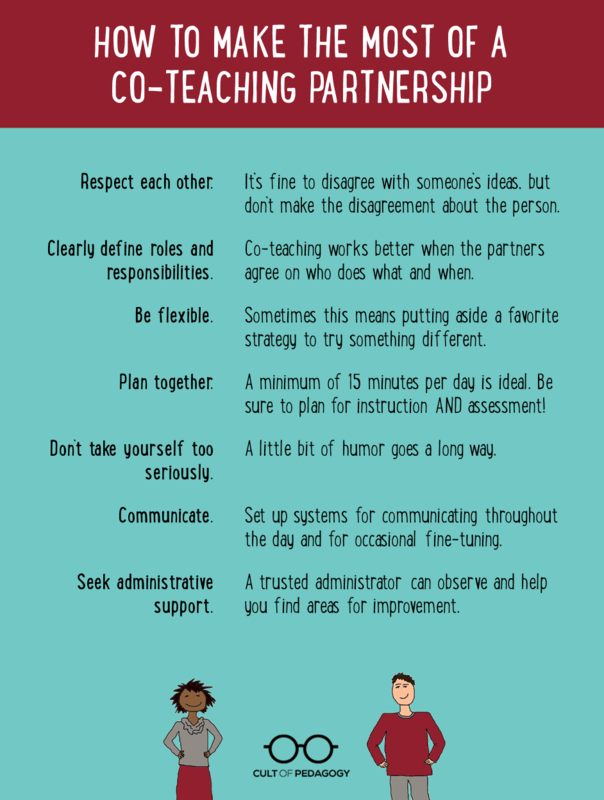 You may also find this article about co-teaching helpful as you reflect on your current co-teaching situation: Successful Co-Teaching. Thanks a lot for such a through article on such an increasingly important topic. I used it to help ‘set’ me as I prepared for a conference presentation on the 6 Push-in Models of in-class support.